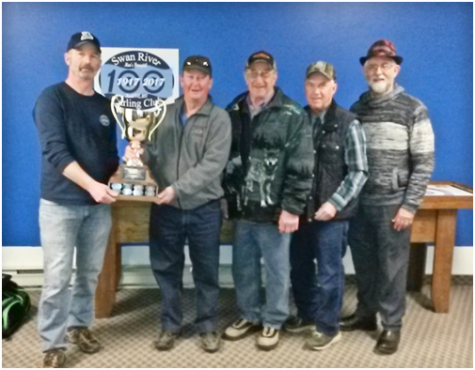 Held this past weekend on March 9-12, 2017, with 42 teams competing, the Men’s centennial bonspiel turned out very successful. Everyone enjoyed the format for bonspiel which was pay per end instead of the usual elimination format. 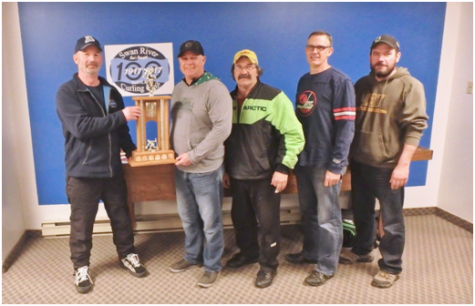 Thursday night started off with three draws and a welcome BBQ even though it certainly wasn’t typical barbequing weather. 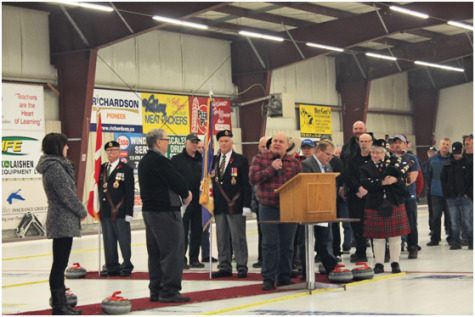 Friday was a full day of curling highlighted by a fish fry and opening ceremony. The fish fry went over very well with everyone, except perhaps our ice maker who complained quite vigorously to me about the haze and grease smell in the rink. I don’t he is going to let us do that again. For the Opening ceremonies, all the curlers were led out on to the ice by a Legion Honour guard and RCMP member while Heather Medwid played the bagpipes. 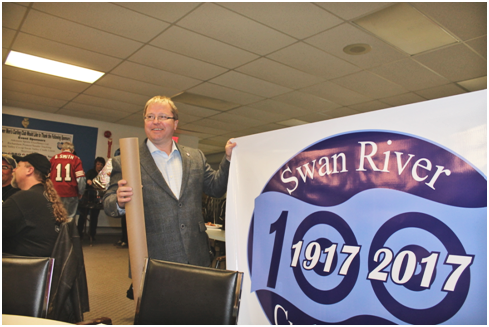 Master of ceremonies Lance Jacobson introduced Mayor Glen McKenzie and MLA Rick Wowchuk. It was then time for the opening draw. 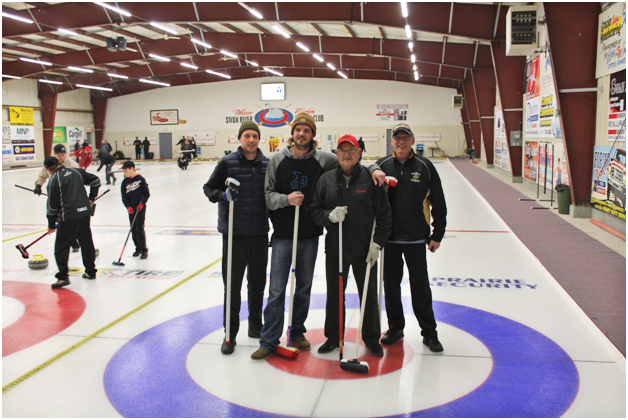 Doug Hichliffe held the broom, Frank Barkovics threw the rock, Kael Jacobson and Dawson Kolisnyk-Genaille swept the rock for a great shot. 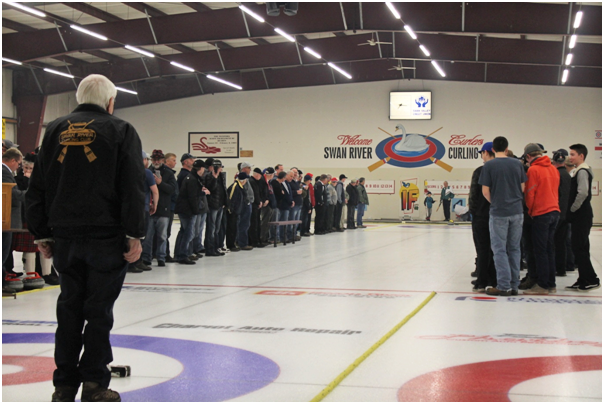 After the ceremonies, the Shoot to Win contest was held with Newt Duncalfe drawing the closest to the button, followed by George Oberlin, Seth Harris, and Dustin Tibble. JARD music kept the tunes going till closing time. Saturday was the Banquet and Dance. Master of ceremonies Dave Bettsworth kept the program rolling along with Bob Tibble and Doug Hinchliffe giving a brief history og the curling club The Sticks in the Mud put on a very good show to wrap up the evening. The draw for the trip to Vegas was won by Brian McKay. The Bonspiel Committee Consisted of Chairman Scott Tibble, Murray Mullin, Brent Scales, Gary Slack, Kelly Tibble, Bob Tibble, Lance Jacobson, Doug Hichliffe, Jim Webster, Dave Bettsworth, Charlie Campbell, Dwayne Strate, Barry Tall. Many other people contributed to the success of the event and committee would like to express our thanks. 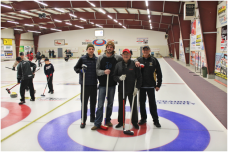 Special thanks to our ice maker Kent Meyn and the Debbie Sutherland crew for their hard work. 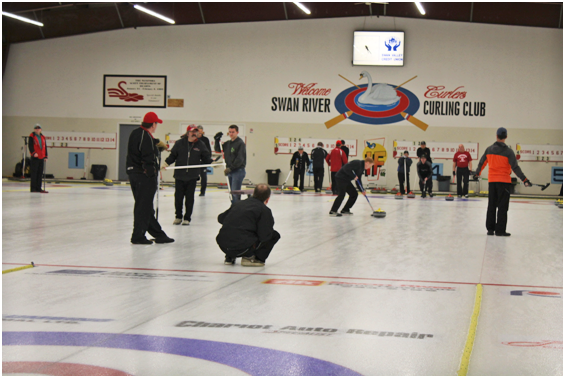 Event Sponsors – Atkinsons Sports Excellence, Richardson Pioneer/Sauder Trucking, SV Co-op/SV Credit Union, Westwood Inn. Additional sponsors include Valley Plumbing & Heating, Neal Watkins, Larry Kobelka, Parish & Heimbecker, and Sysco. Thanks to Formo Motors and Redline Chrysler for the use of the courtesy vehicles.